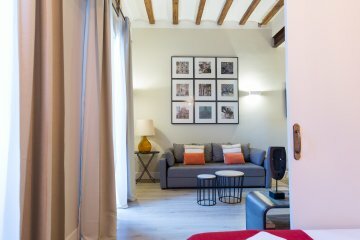 This newly renovated vacation apartment in Barcelona has three double bedrooms, one with double bed and the other two with twin beds. One bedroom has access to a furnished balcony and the other two have windows towards the inner court and are very quiet. There are two full bathrooms both with shower. The kitchen is fully equipped and opened to the cosy and comfortable living room. There are also other holiday apartments in the same building in case you are a larger group. Each apartment is well equipped with all tiled floors / marble and includes flat-screen TV, and doors have traditional high ceilings, living room with sofa bed, DVD player and kitchen / diner with cooker and hob, fridge, toaster, microwave, coffee and kettle. WEFLATING apartments in SANT ANTONI MARKET is located in one of the trendiest neighborhoods in Barcelona, 80 meters from Sant Antoni Market and 5 minutes walking from the metro station Poble Sec. Housed in a nineteenth century building with lift all these apartments have furnished balconies or even furnished terraces, free Wi-Fi access and air conditioning or funs. 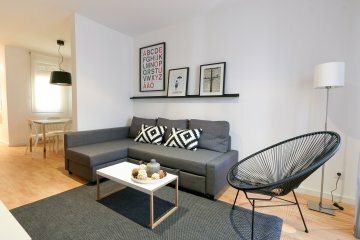 The apartments are in 5-minute walk from bars and traditional Catalan food restaurants and 10 minutes’ walk from Las Ramblas and the Boqueria market. Each apartment is well equipped with all tiled floors / marble and includes flat-screen TV, and doors have traditional high ceilings, living room with sofa bed and kitchen / diner with cooker and hob, fridge, toaster, microwave, coffee and kettle.